Seoul is home to a number of wonderful free museums that tell the fascinating stories of Korea’s history. But Poopoo Land is the only attraction to help you find out what your flatulent sounds say about you. Poopoo Land is a bright, wacky exhibit that doesn’t waste an inch of its three-floor space, but dives deep into the universe and science of poop, farts, and anything in between. It’s an Instagram gold mine—you and your companion can pose on matching toilets, get up close and personal with a urinal, or see a display of many different kinds of toilet paper. Fittingly for a place called Poopoo Land, it is the exit which is most memorable. After going through a rather intense dark room designed to mimic the digestive system, you exit via an “extreme slide.” While not particularly long, the slide is very steep, and to prevent friction, you’ll be given shoe covers and, if you have short sleeves or a skirt, over sleeves and special over pants (which the attendant gleefully calls “poopoo pants”). Used poopoo pants are deposited in a brown sack at the end of the slide. 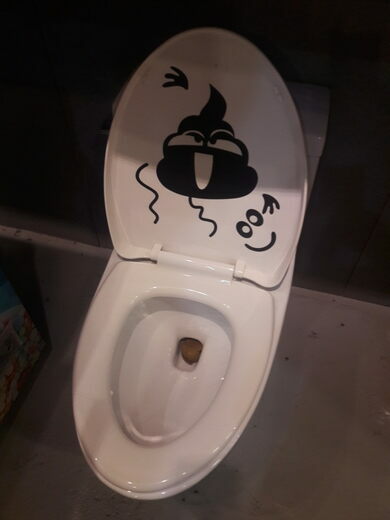 On the upper levels of the same complex as Poopoo Land you’ll also find a poo-themed cafe, which offers such appetizing delicacies as curry served in a toilet-shaped bowl, as well as toilet-themed drinks and desserts. For a more affordable option, check out the stall selling poop emoji-shaped snacks downstairs. If you’re lucky, there may also be a Poopoo pop-up shop on the ground floor to get your own lucky charm. The darkest building on Earth was built for the snow-white scenery of the 2018 Winter Olympics. About as hidden as can be, this specialty coffee shop is wedged between multi-story buildings at the end of a dark, skinny alleyway in Seoul.